DHAKA: Embattled Bangladeshi ex-prime minister and main opposition leader Khaleda Zia today faced another setback when a court here issued an arrest warrant against her over a deadly arson attack on a passenger bus during an anti-government protest campaign last year. The Metropolitan Sessions Judge’s Court of Dhaka passed the order against the 70-year-old chairperson of the main opposition outside parliament Bangladesh Nationalist Party (BNP) and 27 others from her party after accepting police’s chargesheet in the case. Judge Kamrul Hossain Mollah, after accepting the charges against 38 people including the 28, passed the order in connection with the arson attack in Jatrabari area in Dhaka in January last year when Ms Zia’s party spearheaded a violent nationwide campaign to topple Prime Minister Sheikh Hasina’s ruling Awami League government. “The court issued the arrest warrant against begum Zia in connection with an arson attack on a passenger bus in January last year,” an official of the Metropolitan Sessions Judge’s court told reporters. He said Judge Kamrul Hossain Mollah passed the order and asked police to execute the warrant and submit the compliance report by April 27. 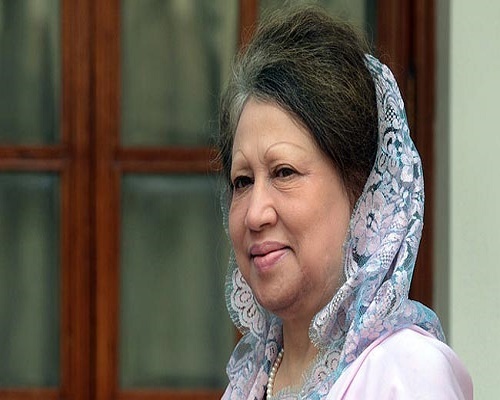 Lawyers and legal experts, however, said Ms Zia was likely to get a chance to secure bail appearing in the court ahead of the deadline. Last year, ,Ms Zia was charged by police with masterminding the arson attack on a bus that left 29 people injured, nine of them critically, days after Ms Hasina said the former premier could be put on trial for recent violence. Today’s arrest order is yet another blow to the beleaguered two-times former premier, who has described previous cases, including corruption-related, against her as politically motivated and aimed at keeping her out of politics. The development came hours after another court in the capital sent BNP’s just-elected secretary general Mirza Fakhrul Islam Alamgir, accused of several identical charges of sabotage, to jail but soon after, ordered his release as his lawyers said he fell sick after his imprisonment. Mr Alamgir’s imprisonment order came hours after BNP announced him as the secretary general of party, six years after he served as the acting secretary general of the party. Soon after the announcement, Mr Alamgir appeared before the court with a prayer for bail on expiry of his existing bail, granted earlier High Court. “The magistrate denied his prayer and ordered him to be sent to jail… hours later the same court granted him bail as his lawyers filed a fresh petition saying their client became sick in the prison,” an official of Dhaka Metropolitan Magistrate Court told news agency PTI.